ALL THE THINGS happened this episode. Will finds out that Alicia is leaving! He fires her and the fourth years! Security guards frog-march the rebels out of the building! Will and Alicia have a vicious argument! Diane and Cary have a vicious argument! Peter and Will have a vicious argument! Will and Alicia have more vicious arguments! Losing clients and their office space after Lockhart Gardner launches a slander campaign and gives the health department a phony anonymous tip, Alicia and Cary race to save their new-born firm! Peter scuttles Diane’s Illinois Supreme Court nomination in revenge for her attacking Alicia! Those who create and write television series deploy a range of tools designed to keep shows fresh. New characters, new subplots, marriage, birth, death—all can serve as narratological Botox, injecting aging shows with a veneer of youthful vigor. It is far rarer—and more thrilling—to see an attempt to rewrite a show’s DNA. That is the course that The Good Wife’s writers embarked on in “Hitting the Fan.” By the end of last season, the show’s overarching narratives—Alicia’s transformation from humiliated housewife to confident professional, Peter’s political rehabilitation, Alicia and Will’s romance—had played themselves out. The show had reached a point where it had to reinvent itself or wither. As I noted in my first recap, The Good Wife has followed Lockhart Gardner’s fate as much as it has Alicia’s. By splitting the firm, the writers are altering the show’s fundamental structure. It’s too soon to know whether the reinvention will succeed, but at least the creators are making a serious effort. This episode also set Alicia’s character on a new trajectory. During the past four seasons, Alicia has grown in strength. She has also shown an increasing willingness to bend the rules, work with dubious allies, and deceive or betray those around her. Last season, she and the other fourth year associates rebelled after Lockhart Gardner management offered them partnerships, and then rescinded the offer. Will and Diane, having identified Alicia as the rebellion’s ringleader, offered a partnership to her alone, contingent on dropping her support for the other fourth years’ complaints. She accepted with only a modicum of hesitation. In “Runnin’ with the Devil,” she looked the other way while her “co-counsel” Wallace Shawn Charles Lester—drug dealer Lemond Biship’s enforcer—threatened several opposing witnesses into recanting. While the episode initially struck a comic tone (because hey, Wallace Shawn), Alicia’s collaboration with Lester became downright uncomfortable when he turned his malevolent attentions to the opposing counsel’s children. While portraying Alicia as increasingly morally compromised was an interesting choice, I worried last season that the writers were failing to show the consequences of that shift. Alicia’s more unsavory actions didn’t affect the people closest to her—Will, Diane, her family—and they didn’t change how she saw herself. Neither she nor anyone else noticed the increasing gap between her public role as “Saint Alicia” and the actual choices she was making. In “Hitting the Fan,” the writers finally have begun to process the more problematic aspects of Alicia’s transformation into power lawyer. Alicia makes a series of ethically questionable decisions over the course of the episode: she convinces one of the judges who’d been caught up in Will’s season three bribery scandal to stick Lockhart Gardner with a restraining order and she suggests that Florrick Agos pursue Lemond Bishop as a client (Cary the former prosecutor shoots down this idea). After Florrick Agos appear to have lost Neil Gross and the Google Chumhum account, Peter gives a speech suggesting he might tax internet companies. The speech is a threat aimed at Gross: either he can give his business to Florrick Agos, or he can face taxation. The speech is clearly unethical, but Alicia cheers with glee when she hears it. For this season’s first four episodes, Alicia seemed huddled under a cloud of hesitation and guilt; that’s gone now. Yes, she breaks down alone in the elevator after Will fires her—but it’s the last glimpse of vulnerability or grief we see. For the next thirty minutes of screen time, Alicia appears to be having the time of her life—not despite the bruising combat at dirty tricks, but because of them. 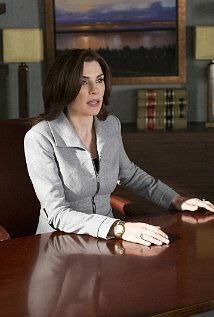 The Good Wife has always portrayed the practice of law as an elaborate game. Florrick Agos and their opponents see arguments and evidence not as representations of truth, but a stratagems, to be dispensed with the moment they cease to be useful. In more than one instance, Lockhart Gardner have found themselves attempting to contradict a line of argument they themselves advocated in a previous case. The show’s writers have portrayed this gamesmanship as fun (and funny) rather than despicable. Over the past four seasons, we’ve seen Alicia fall in love with the game. Now, she’s playing for the highest stakes yet, and against opponents worthy of her. I don’t love how the writers set up Alicia’s departure from Lockhart Gardner. Throughout the latter part of season four, it was clear that Alicia’s discomfort with her continuing attraction to Will was the catalyst driving her to consider Cary’s offer to start a new firm. The season finale confirmed that impression. On the night of Peter’s gubernatorial election, Alicia and Will make out and agree to discuss their future the next day. Instead, Alicia leaves Peter’s victory celebration to tell Cary she wants to join his new firm. The writers imply that she’s running away from her feelings for Will. It’s a blistering speech. But anyone who remembers how easily Will and Diane bought Alicia off with a partnership is going to be thinking, “Wait, Alicia actually cares now about the fourth years getting screwed over?” I’m not sure if the writers are suggesting Alicia is in denial about her real reason for leaving Lockhart Gardner, or if they are attempting to retcon the narrative to give her a reason more intriguing than “I’m afraid I’ll fall back into bed with Will. The brilliant staging of the two rival firms’ aborted meetings with Neil Gross: using contrasting physical levels to emphasize power relationships is a ubiquitous technique on stage and screen, but it’s ubiquitous because it works. Followed by his retinue, Gross descends a spiral staircase from some undefined space past the upper edge of the screen. The vaguely neo-classical lobby space reinforces the impression of a monarch granting audience. Also, the wall of Gross’s lobby is decorated with images of chess pieces—a nod to the gamesmanship between Lockhart/Gardner and Florrick Agos? Will passing Grace’s message about her missing permission slip along to Alicia: the scene’s comedy derives from the abrupt shift of tone. Will and Alicia have literally just finished telling each other to go to hell: when Will brings up Grace’s permission slip, it’s as though a tidal wave paused to let a puppy scramble to safety. But the comedy is cut with sadness; the final moments of the conversation are the echo of a normalcy now lost.